Dr Williams’s Library contains over 600 books in Italian or printed in Italy. There are 97 printed in Spain, Portugal and Mexico, with a number in Spanish printed elsewhere. It is generally accepted that these had been the property of Dr William Bates (1625-1699), clergyman and ejected minister. 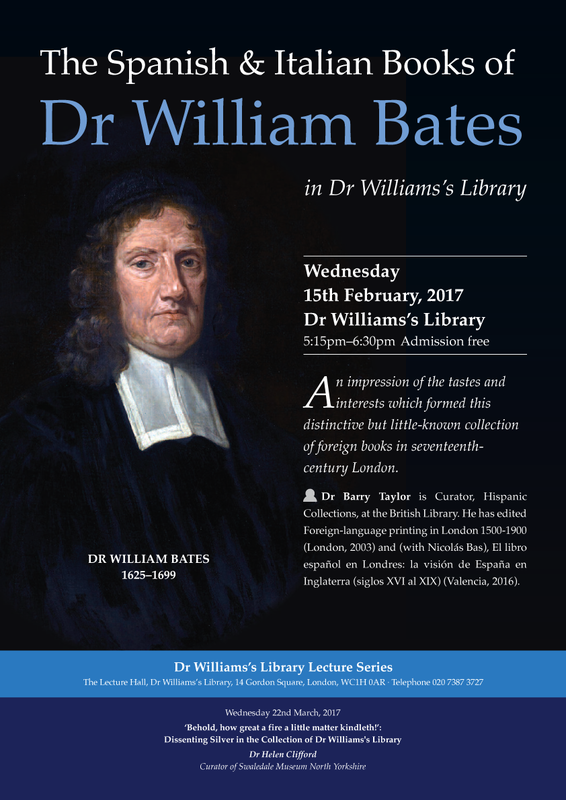 This lecture will attempt to give an impression of the tastes and interests which formed this distinctive but little-known collection of foreign books in seventeenth-century London. Dr Barry Taylor is Curator, Hispanic Collections, at the British Library. He has edited Foreign-language printing in London 1500-1900 (London, 2003) and (with Nicolás Bas), El libro español en Londres: la visión de España en Inglaterra (siglos XVI al XIX) (Valencia, 2016).